SULLY, IT'S ME with Brian Stetler | Says Who? Dan has been in England for a week and now it’s time to come back to America and Election 2016--but first, he has a nice, quiet plane ride with no access to the news. Surely that will go well. Like Dan’s plane, this election is coming in for a landing. How will this last week go? We asked CNN’s Brian Stelter to talk us through this final week and to discuss the role the media has played in this entire, never-ending (but maybe actually almost ending?) election. Come on, everyone. We’re landing this election on the Hudson. Hang on tight. SPECIAL NOTE: next week, at 8pm EST, we’ll be going LIVE on election night. Follow @sayswhopodcast to get that live link and to join in. It's sure to be something. 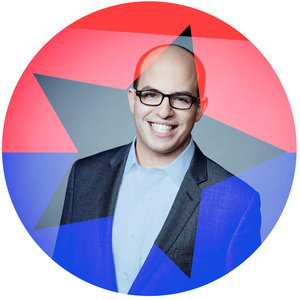 Brian Stelter is the senior media correspondent for CNN Worldwide and the host of Reliable Sources, the Sunday morning media program on CNN/U.S. As CNN’s senior media correspondent, Stelter reports on trends, personalities, and companies across the media spectrum, from news to entertainment. He appears regularly on CNN/U.S., CNN International, CNN.com, CNNMoney.com, and across CNN’s vast mobile and social landscape. Stelter started at CNN in November 2013. He was previously a media reporter for The New York Times. The captain was played by Simon Cole. Simon is a London-based actor and voiceover artist. Find out how to have Simon narrate your audiobook at simoncole.co.uk. The flight attendant was played by Julie Polk. Julie is the co-founder of Rasa Advising, which teaches storytelling to public defenders and other legal advocates, and host of Story Social, a monthly story show at QED Astoria. The first class passenger was played by Jason Keeley. Jason is a game designer and improviser from Seattle. Volunteer for the Hillary Clinton campaign directly. The Harry Potter Alliance is an organization that promotes social equality. Their Wizard Rock the vote program offers several ways for you to get involved locally and nationally. Rock the Vote is one of the leading organizations for getting young people involved in the election process. Emily’s List is an orgnaization that works to elect pro-choice Democrat women. Our awesome theme is courtesy of Ted Leo. He goes on tour next week check the dates now. Says Who's Logo was made by the one and only Darth. We :heart: Darth.